Uptown Aces Casino opened its doors in 2014 and ever since it has been a great destination for both experienced and new players alike. With hundreds of slots and dozens of table games on offer, you can’t go wrong by trying your luck at Uptown Aces. And, of course, there are plenty of promotions to benefit from, such as a whopping $8,888 welcome bonus! Uptown Aces Casino opened its doors in 2014, yet it benefits from the backing of Deck Media. As a casino owned and operated by this prestigious gambling group, it can tap into its experience. Players from several American states are allowed to play here, but residents of New York, Kentucky, Washington State, Maryland, New Jersey, Louisiana and Missouri are denied access. Among those who are not allowed to sign up for an account are those who reside in the United Kingdom, Moldova and Israel. Deck Media decided to use exclusively Real Time Gaming software for Uptown Aces Casino games. It is a steep departure from the software used by other casinos in their group, such as WGS, Rival Gaming, Betsoft or Parlay. The software developer is perfectly suited for the American market, with US players being quite familiar with their games. The propensity for slots means that table games, video pokers and other genres enjoy less exposure, but that’s a reasonable price to pay. If we were to talk numbers, the Uptown Aces games include more than 150 titles, with slots exceeding 100. Card games progressives such as Aztec’s Millions, Caribbean Draw Poker, Caribbean Hold’Em Poker, Caribbean Stud Poker, Jackpot Cleopatra’s Gold, Jackpot Piñatas, Let’ Em Ride, Football Frenzy and Shopping Spree II have developed a cult following. They belong to both slots and video poker genres so they reward luck as well as skill. Specialty Uptown Aces Games feature American Roulette, Craps, European Roulette, French Roulette, Multi-Player Roulette and Sic Bo. For Video Pokers, players get to choose between Aces and Eights, All American Poker, Bonus Deuces Wild, Bonus Poker, Bonus Poker Deluxe, Deuces Wild, Double Bonus Poker, Jacks or Better, Joker Poker, Loose Deuces and Mystery Bonus Poker among others. Uptown Aces online casino has a special section dedicated to table games which can be played in single or multi-hand format. Baccarat, Blackjack, Caribbean Draw Poker, Caribbean Stud Poker, European Blackjack, Face Up 21, Pai Go Poker, Pontoon, RedDog, Super 21, Texas hold ‘em Bonus Poker, Vegas Three Card Rummy and Tri-Card Poker are all featured. It’s very disappointing that you can’t play any of them against real dealers, but then again the random number generator is audited for fairness. Real Time Gaming is specialized in the development of slot machines and that’s why the list of such games is significantly longer. Uptown Aces Casino slots include Achilles, Aladdin’s Wishes, Aztec’s Treasure, Bubble Bubble, Coyote Cash, Enchanted Garden, Enchanted Garden 2, Food Fight, Green Light, Hairway to Heaven, High Fashion, Lucha Libre, Nova 7’s, Orc Vs Elf, Panda Magic, Return of the Rudolph, Ronin and Santastic. There are several ways to enjoy these games, with the most straightforward one being to play straight in the browser. The alternative is to download the games on your device and everything from desktop computers to laptops and mobile devices can be used. For mobile users, Uptown Aces is working on a dedicated app but they don’t have one at the time of writing. More than half of their games can be played on smartphones and tablets and the percentages even higher for slot machines. It makes no difference if players use an Apple or Android device, they can rely on needs to play casino games here. Those who stick to computers have the advantage of playing several games simultaneously if they feel like it. Since live dealer table games are not offered, this is the kind of park that many players regard as very important. All the features available to regular customers, such as the ability to deposit and withdraw funds or contact customer support are available to smart phone users. Compared to mainstream gambling operators, Uptown Aces seems to be in a league of its own when it comes to the introductory offer. The first six deposits will be matched up to a maximum of $8,888, as long as players use the correct coupon code. 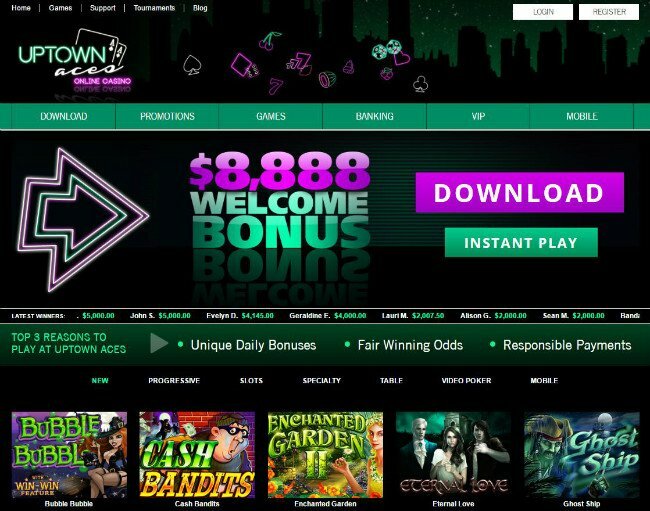 Uptown Aces Casino bonus code UPTOWN1ACES is the first to use and only the digit changes from one to six, with each new deposit. All bonuses are subject to a 35 times wagering demand which also applies to the amount deposited. When you load your account for the first time you have the amount matched by 250% up to $3,500. Players can add money in increments of $1,500, three chunks of $1,000 and the final bundle of $1,888. Given the stiff rollover rate, players need to think twice before going for the maximum bonus. They only have one month to clear the bonus and after the threshold is hit, the amounts expire and are removed from their account. One can only play slots, scratch cards and keno to clear the bonus, but not the ones carrying progressive jackpots. Add to this the fact that you are limited to a maximum $6.50 bet per spin. New players are also eligible for special Uptown Aces Casino bonuses aimed at games. Players who prefer table games will have the first deposit matched by 150% up to $750. Video poker fans enjoy a very similar deal, but their deposit is only matched by 75% up to the same limit. On the bright side, nothing prevents players from cashing in on both bonuses to accumulate a combined amount of $1500. Depending on what games they choose, they will have to play the bonus between 30 times and 120 times. Baccarat, bingo, craps, roulette, pai-gow poker, poker, sic bo, and casino war games don’t qualify. Uptown Aces promotions go beyond the welcome bonus and are aimed at also rewarding existing players. This is what the loyalty scheme stands for and it is centered on the comp points, which are awarded to players who bet real currency. They will be able to trade them at a rate of 100 comp points for one dollar in cash. 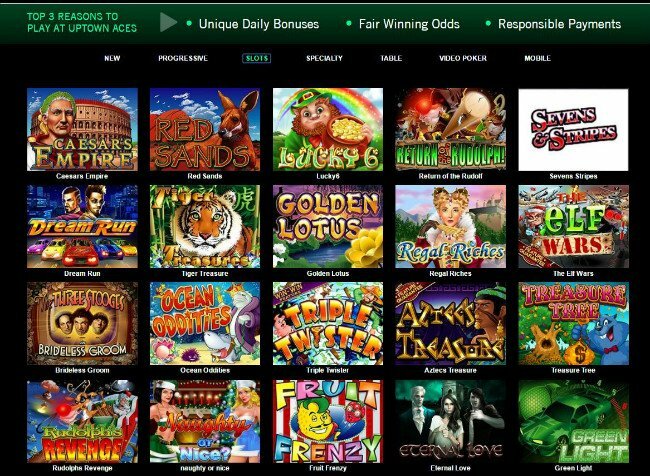 Unlike regular promotions which are targeted on a particular game, this one will allow players to choose any slot machine, table game, video poker, scratch card or keno game. The Low Playthrough Bonus appeals mostly to beginners and players who can’t afford to bet larger amounts. The first deposit is doubled up to $100 and the bonus has a low wagering requirement of 15 times the amount. Once again, it is limited to scratch cards, keno and slots, but it should be more manageable for amateurs. While these bonuses are pending, players can sign up for new promotions and participate in other campaigns without any restrictions. On Monday, those who play scratch cards, keno and slots are eligible for 100 free spins if they deposit a minimum of $30. The amount is also doubled and the same happens on Tuesday, but the difference is that on this day they only receive 77 spins. 50 enchanted spins are up for grabs from Tuesday to Thursday and during the weekend deposits are matched by 250%. The wagering requirements are also lower during this time of the week, to only 25 times the combined amount. Twice a day throughout the week, players are eligible for 100 free spins when they make an Uptown Aces Casino deposit. Investments made on Saturday result in a bonus worth 77% and on Sunday the ratio increases to 88%. Black Jack, Video Poker and Progressive Jackpots Bonuses are available twice per day and they represent 50% of the amount deposited. The fans of these games also benefit from an exclusive 25% cashback deal. It has a lower 10 times play through demand, so it’s easy to clear the bonus. Comp points have a two-pronged effect, in addition to generating more cash they also help players advance up the loyalty ladder. The VIP program has four levels and those who enter the club will unlock progressive rewards. They need to be active for 30 straight days and then maintain their status to reap the same benefits at the beginning of a new month. Level I goes by the name of Neon and requires a minimum purchase of at least $1,000 and 500 comp points earned. It offers daily bonuses, instant cash backs and faster withdrawals, as well as a generous birthday bonus. Uptown Aces Casino promotions get better for those who become VIP players of second rank called Downtown. Basically all the perks already available to them get better, with bigger daily bonuses and more generous weekly cash backs. Midtown is the third VIP level and only those who spend $10,000 and accumulate in excess of 2,000 comp points qualify. The cash back increases to a massive 40% and players benefit from higher bet limits and unlimited maximum payouts. Uptown Aces Casino offers the best deals to those who have entered the Uptown section of their VIP club. The cash back surges to 50%, players can receive daily bonuses of up to $750 and it takes less time for their profits to reach their bank account. The best gaming experience belongs to those who bet real currency and for this purpose they can use several payment methods. VISA, MasterCard and American Express are all fine choices for the ones who prefer credit and debit cards. Deposits are performed instantly and withdrawals take less than three business days and no commission is charged. This is what differentiates this payment method from other financial instruments offered by the casino. The cryptocurrency Bitcoin is also accepted can be used in both directions, which is very convenient for US players. The waiting time isn’t longer either, so it’s not surprising that this is one of the most popular Uptown Aces payment methods. Only those who deposit it in this way can cash out their profits via bitcoin, but they do so with no commission paid. By comparison, bank wires, checks, and electronic wallets are charged a commission ranging from $20-$60. When it comes to deposit and withdrawal limits, these also vary greatly from $25 for e-wallets to a staggering $3,000 for checks. The Uptown Aces Casino payment methods are also subject to a $4,000 maximum weekly limit. This can be lifted gradually, but won’t exceed $5,000 which can be a problem for those who play progressive jackpot slots. Depending on the financial instrument chosen, players will be asked to provide additional documents and proof of identity. uptownaces.eu might be one of the best Deck Media’s casinos, but it still doesn’t offer live chat to prospective customers. The decision to limit access to this useful tool to registered customers compels prospective clients to open account. Once they become members, they enjoy the complete package, which includes toll free numbers, email assistance and the aforementioned live chat. They work 24/7, so whenever you need help you are guaranteed to receive it promptly and professionally. All their specialists are supposed to be native speakers and even if they aren’t, at least they’re fluent in English. What we have here is a promising casino that has achieved astonishing things in just three years. The fact that they were founded in 2014 shouldn’t deceive prospective customers because they benefit from the experience of their parent company. It’s clearly a place where slot machines enjoy preferential treatment, but fans of other genres aren’t left on the outside. They will definitely miss the live dealers for table games, but as far as slots and video pokers are concerned, the offer is comprehensive. The attention paid to mobile device users is impressive and recommends Uptown Aces Casino to those who spend a lot of time on smartphones and tablets. The list of payment method is already long and constantly expanding, which means that there are several options for every player. By European casino standards, the Uptown Aces Casino withdrawal times can be a little slow. However, this is the compromise that US players need to make to be able to enjoy all the sweets Uptown has on offer.